The old Franciscan Friary in Ennis, Co Clare, is now an archaeological site managed by the Office of Public Works. But the Franciscans maintain a living presence in the town in their friary just around the corner, on Francis Street. 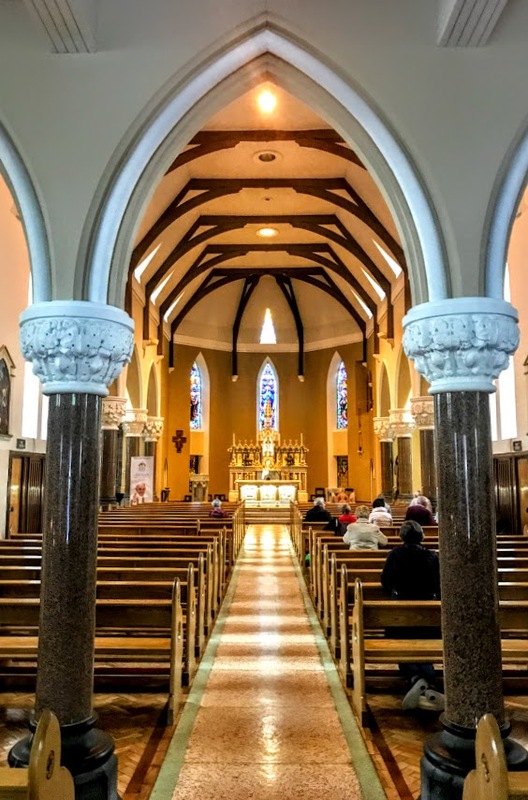 Following a decree under the Penal Laws requiring priests who were members of religious orders to leave Ireland, at least four Franciscan friars in the Ennis area decided to register as parish clergy after 1697, and the friars continued to live among they people in Co Clare. 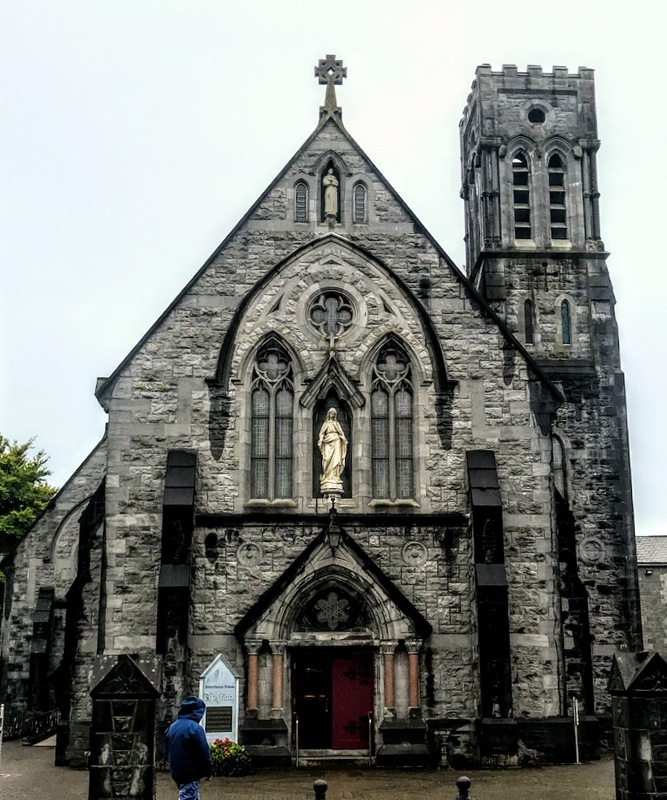 After living a hidden life outside the town for a time in the 17th and 18th century, the Franciscans began to return to Ennis, and they were living again as a community in Lysaght’s Lane by 1800. The friars then moved to Bow Lane, where they opened a new chapel and friary on 12 December 1830. In 1853, the Franciscan Provincial threatened to close the friary in Ennis unless conditions were improved. The Franciscan community in Ennis responded by buying the present site at Willow Bank House on Francis Street and in 1854 Patrick Sexton designed a new chapel. The architect Patrick Sexton was active in Ennis from the 1850s until at least 1880. His new cruciform chapel was built by the Ennis builder William Carroll between June 1854 and December 1855. The first Mass in the new church was celebrated on 1 January 1856, and the church was dedicated as the Church of the Immaculate Conception on 10 September 1856. At the end of the 19th century, a new friary church, designed by William Reginald Carroll (1850-1910) and incorporating Sexton’s earlier church, was built in the Gothic Revival style in 1892. The Ennis-born architect and civil engineer William Reginald Carroll was born in 1850, a younger son of William Carroll, who had built the earlier church in the 1850s. 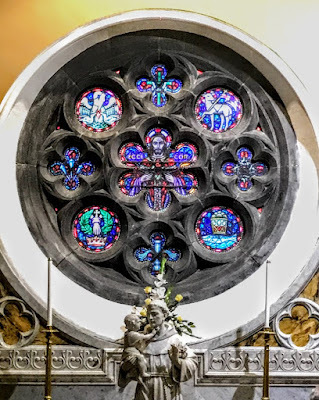 Carroll designed the new friary church in Ennis in the 14th-century Gothic style, with a nave, apse, two side chapels and a tower. The altar was designed by the Dublin-based monumental sculptor, James Pearse (1839-1900), the father of the 1916 leader, Padraic Pearse (1879-1916). Pearse, who also designed the reredos in Saint Mary’s Cathedral, Limerick, was born in London in 1839. He was brought to Dublin from Birmingham by Charles William Harrison around 1860 as the foreman of his monumental sculpture workshop at 178 Great Brunswick Street. 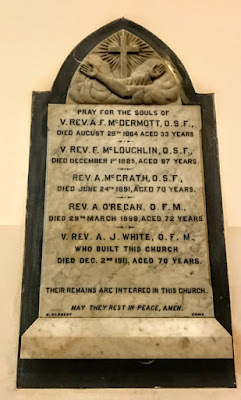 Pearse, who was a Unitarian, died suddenly in 1900 in Birmingham while he was visiting his brother. The church was built by a local builder, Dan Shanks, at a cost of £11,000, and was dedicated on 11 June 1892. The church is a T-plan, gable-fronted church, with a polygonal apse, a tower to the west, and a connecting block that leads to the neighbouring friary. A statue of the Virgin Mary stands in a niche on the façade and is flanked by lancet windows with stone tracery, and with a quatrefoil and hood moulding above. Paired lancet windows are set between the buttresses. Inside, the church has an open timber roof, with tongue and groove sheeting. There are four polished granite columns with carved stylised ivy capitals that divide the nave from the transepts. The stained-glass windows are by Earley. The foundation stone of the earlier church on the site is set in the grotto beside the church. The architect William Reginal Carroll moved from Ennis to Ewell in Surrey around 1899 and soon after to Belgium, living first in Bruges and then in Brussels. He died at his home in Brussels on 8 April 1910. 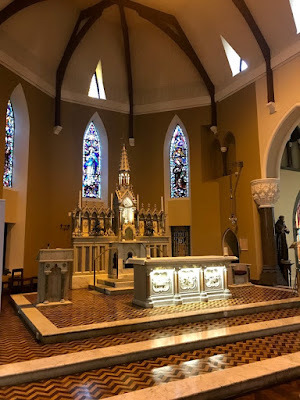 Meanwhile, a new friary was completed in 1877, and the Franciscan house in Ennis remained the official novitiate of the Irish province until 1902. The friary site includes the site of the birthplace of William Mulready (1786-1863), the Ennis-born artist who studied at the Royal Academy and designed the first penny postage envelope, introduced by the Royal Mail at the same time as the ‘Penny Black’ stamp in May 1840.